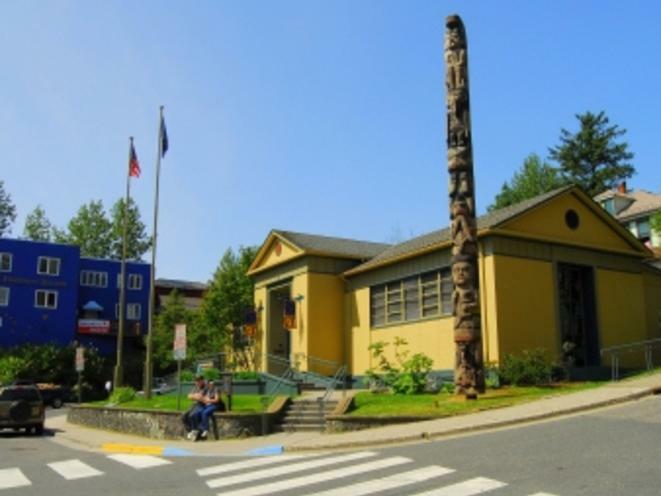 A visit to The Juneau-Douglas City Museum will introduce you to the rich and diverse community of the greater Juneau-Douglas area through exhibits focusing on local history, art and culture. 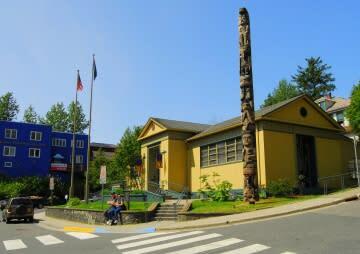 Open year round, we offer permanent exhibits on fishing (including a 500-700 year old basketry-style fish trap), mining, skiing, Southeast Alaska Native history and lifestyles, politics and statehood. We also offer a variety of temporary exhibits throughout the year including shows by local artists and topical exhibits on local history and culture. Open Tuesday through Saturday from 10am to 4pm. FREE, thanks to generous donations from local supporters. Our Museum store features unique items by local artists, books and trail guides by local authors, toys, prints, jewelry and cards. Wood and Waterways, A look at Tlingit Canoes: This permanent exhibit invites visitors to learn about the construction, use, and maintenance of Tlingit canoes and paddles from pre-history to today. This interactive exhibit allows visitors to learn the steps involved in making a canoe and about types of paddles. A video from a 2014 canoe journey allows visitors to see a contemporary canoe being made and used for travel between Haines and Juneau. Life on the Water: With no land roads connecting Juneau to other communities, this permanent exhibit celebrates Juneau’s unique maritime lifestyle. Flip-up portholes provide information about Tlingit Canoes, Early Exploration, Steamships, the three USS Juneau naval ships, Freight, Ferries, and Modern Cruise Ships. A “Shipwrecks of Northern Southeast Alaska” map is accompanied by information of seven steamship wrecks which occurred within the boundaries of the City and Borough of Juneau. Juneau Businesses Exhibit: This exhibit offers a glimpse into the commercial history of Juneau through objects, including an “I Spy” interactive. Favorites, by Alice Tersteeg and Dianne Anderson: October brings Professor Alice Tersteeg and Dianne Anderson’s joint show, Favorites, to the Murray Gallery. Anderson is a former student and teaching assistant to Professor Tersteeg and this exhibit is an expression of their teacher-student friendship. This multi-media exhibit will feature pieces melding painting, printmaking and handmade paper collage. Favorites will open with a First Friday reception on October 5th, 2018 and will run through the end of November. On Location with Sydney Laurence: Our December exhibit, On Location with Sydney Laurence, will feature paintings by the local plein air artist group, Plein Rein. The Plein Rein artists have been painting in outdoor locations and from vantage points they believe Sydney Laurence may have painted from one hundred years ago. On Location with Sydney Laurence will open with a Gallery Walk reception on December 7th, 2018 and will feature each artist’s own style and medium. Alexandra Bookless: In January 2019, Alexandra Bookless will exhibit her paintings depicting the social and physical landscape of the North. For this solo show, Bookless strived to produce “refined and aesthetically beautiful work representing the people, wilderness, and history of the North while avoiding the trite and the already-done.” Bookless will juxtapose oil paintings with plein air watercolor paintings to add texture and variety to the exhibition. Bookless’ show will open with a First Friday reception on January 4th, 2019. Crystal Cudsworth: February’s solo artist exhibit will feature new work by Crystal Cudsworth whose multimedia paintings speak to the grandeur of Juneau’s landscape. Cudsworth’s collection consists of oil paintings collaged with pieces of manipulated historical photographs of the mining and milling industry. This series of works will re-tell Cudsworth’s joy of being present in the rugged beauty of Juneau’s outdoor community and will immerse the viewer into the changing landscape. Cudsworth’s show will open with a First Friday reception on February 1st, 2019. Elements, 15th Annual 12x12 Community Art Exhibit: Each year the City Museum hosts a unique community art exhibit in which artists of all ages are encouraged to create works within the parameters of a square or a cube, measuring 12" x 12" (x 12") including the framing. For 2019, we encourage artists to create on the theme, “Elements”. The exhibit will open with a First Friday Reception on March 3, 2019, and run through Saturday, April 20th, 2019.